Posted on August 13, 2016 by Bryan wrote in Blog, Gun Tips, News. Firing your weapon properly accurately and hitting the target means you have proper sight alignment and sight picture. Sight alignment simply means having the front and rear sights in line with your eyesight so you can shoot straight at your target. Your horizontal axis and vertical axis will be lined up. 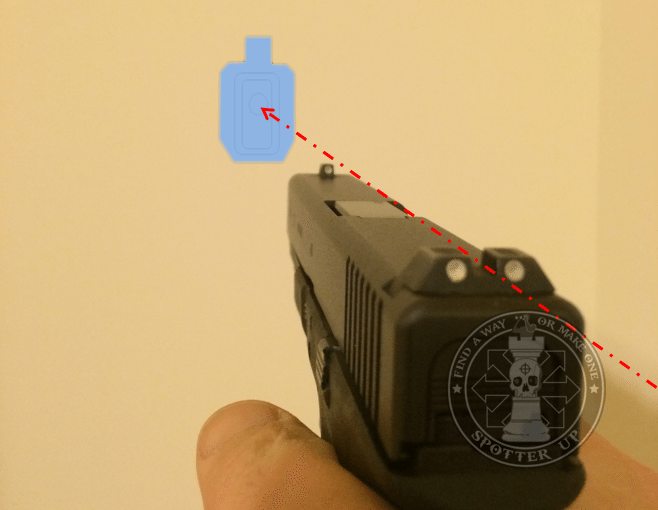 Sight picture means your target is aligned with your front and rear sights. Start with illustration 1. In this picture, the shooter extends his arms and holds his weapon level. The shooter is not looking straight down onto his weapon. The shooter is looking straight out along the length of his weapon. He is looking through the rear sight and through the front sight. When he pulls the trigger the front sight is what he will concentrate on.